Huawei's Sub-Brand Honor has launched its new model Honor 7S in the Indian smartphone market. In the last few months, Honor has consistently launched several smartphones, which clearly shows that the company's goal is to challenge Xiaomi's dominance in the smartphone market. The biggest feature of Honor's smartphones is that they update their previous smartphones and launch a new smartphone. The design of the Honor 7S is also similar as we have already seen in Honor's previous smartpho-nes. However, every time the budget maker Honor in the Metal Body has decided to make a plastic body smartphone. Honor 7S is quite comfortable to use. On the back side, a single camera sensor with LED flash has been given to the top left corner and the logo of the honor is given in the middle of the body. Volume controller and power button are given on the right side of the phone while the three-in-one sim and memory card slot are given on the left. Top of the phone has a 3.5mm headphone jack, while the microphone, micro USB charging port is placed downwards. In addition to the speaker and front camera on the front side, necessary sensors have been provided. At the same time, the company logo is given below. It is surprising, however, that the company has not given fingerprint sensor even in the 2018 smartphone. Well, in the design of the phone you will not get much time to complain. The Honor 7S has a 5.4-inch HD + display with a resolution of 1440X720 pixels with an aspect ratio of 18: 9. The color of the display and clarity in Sunlight is great. Since it is an entry level smartphone, we did not have any much expectations from this. Whether you use indoor or this direct sunlight in this smartphone, you will not have any problem. If we talk about the camera, the Honor 7S has a 13-megapixel single rear camera setup with LED flash light which makes good photos click. Although photos in low light come little dark. Its front camera is also fine but photos are not very good in the low light. Like the previous smartphones of Huvawe and Honor, in the camera app, you get many features that make your photos even better. If you talk about performance, the Honor 7S has been given the QuadCore MediaTek MT 6739 processor with 1.5 GHz and 2 GB RAM. The phone also has 16 GB of internal storage which can be extended by micro SD. While using the smartphone, we felt it takes much more time than expected during navigation. This may be a software problem because the performance of other smartphones working on this hardware set is much better than that. On the other hand, if you talk about the software, then this smartphone runs on the company's custom EMUI version 8.2 with Android OreO 8.1. This smartphone gives many options of customization to the people who want to keep the home screen clutter free. Apart from this, the company has also added the feature of Face Unlock in it. Since it is an entry-level smartphone and designed for medium users, we have tested it on the same terms. 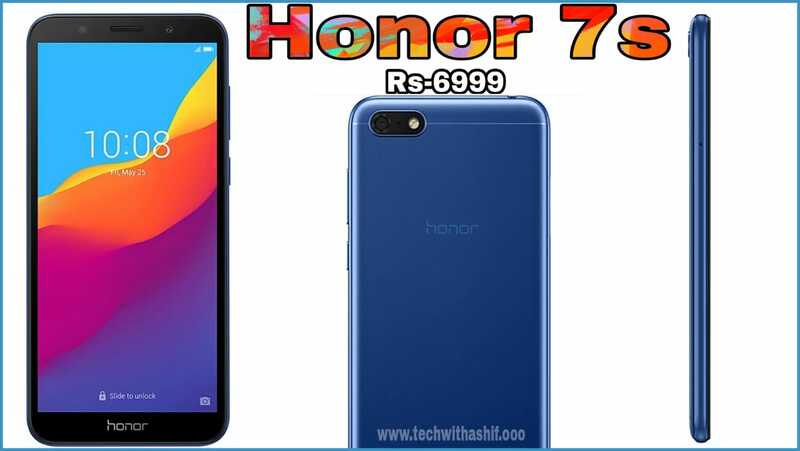 While using, we found that this smartphone with a 3020 mAh battery runs comfortably throughout the day and by the end of the day, about 20% of the battery is still left.Honor 7s With Fabulous price Rs 6999 only on Flipkart. In the price of just Rs 6,999, the Honor 7S offers you a strong body, a great display, a fine camera and a smart battery life smartphone. However, the performance of the smartphone could have been much better. Its price is the biggest plus point for the Honor 7S, because at such a low price he has tried very hard to give more features. Altogether, we can say that we are getting the same amount of money we are paying for the Honor 7S, so this is a money-backed smartphone.